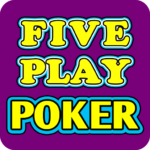 New update for our Five Play Poker. • New games! Triple Double Bonus and Bonus Deuces Wild! • Added ability to skip long win rolls, greater than 250 credits. • Fixed bug that allowed to touch cards during Draw.